I arrived at TADHack Auckland without a clue of what I should do or what’s going to happen. Being a second-year University student, the only experience I’ve had was with crunching big numbers and churning out lengthy algorithms, so this to me could be a huge breaking point. My anxiety was quite high and the number of people who showed up didn’t strike me as being impressive either; only 6 people came including myself. We ended up forming one team, however, none of us had a particular idea in mind. I feared disaster. Things seemed to slowly progress toward a train wreck as we scraped ideas from ideas. Not much was better for the developers either, myself included when we have to scratch our head looking through what APIs that can be worked with. I finally decided to bet the team on Temasys based on how easy and clear the documentation is (hats off to Temasys), and everyone agreed. Even when an idea was solidified and the dev team started hammering away with coding, it was still an uphill battle. We had disagreements every time a decision has to be made, from deciding what can be implemented to things as little as to how our PowerPoint should be laid out. Things only picked up on the last day of the hackathon when we finally got the core functionality to work. All that was left is to cram in some extra “nice to have” features and to make the prototype somewhat more presentable by sprinkled in some CSS here and there. We finished the prototype just in time for the pitch, which went swimmingly. Well done team! Everyone celebrated, cracked open few drinks and called it a day. Its amazing how 6 strangers and one hastily hacked together but relatively-polished prototype snatched us First place for the Temasys global prize. I myself was amazed by what I could achieve, while still in my University years. 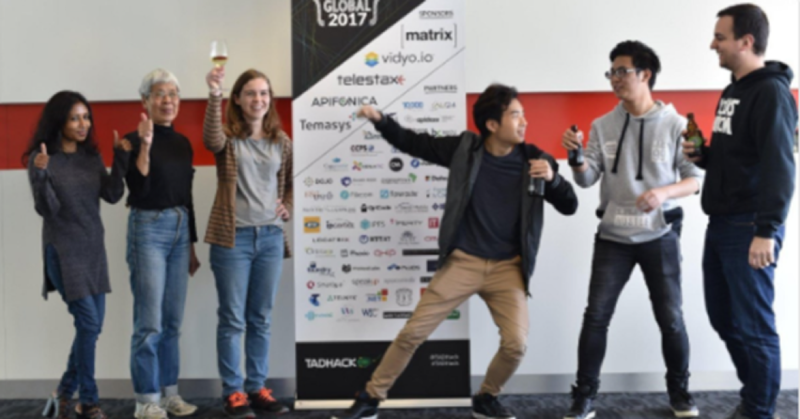 I cannot give enough thanks for the opportunities that TADHack have given us and the people that help organized it.